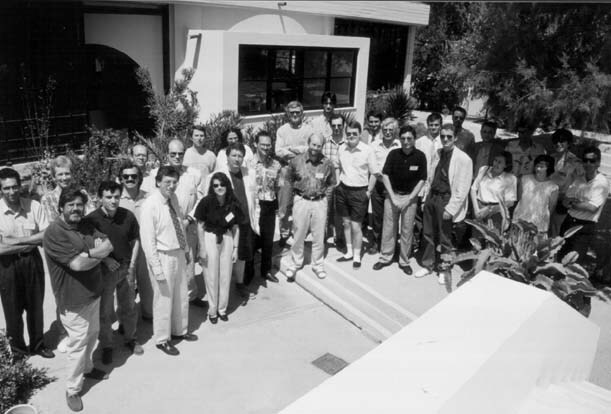 The first workshop of the ERCIM Parallel Processing Network was held at the Creta Sun Hotel in Gouves near Heraklion from 8 to 10 June 1994. The workshop was organised by FORTH and attended by about 30 researchers from nine ERCIM partners. The objectives of the workshop were to introduce ERCIM researchers in parallel processing to their colleagues in other institutes, to present and review current parallel processing research activities within ERCIM, to identify some of the key research problems in the area and to initiate proposals for follow-on activities between the partners. On the morning of the first day, the workshop heard short presentations from each partner on their current parallel processing research activities. The workshop then broke up into three parallel sessions on parallelization, architectures and I/O intensive applications. In each session a leading ERCIM researcher gave a short keynote talk to review the current state-of-the-art in the area and introduced a discussion on some of the key outstanding research problems in that area. This theme was developed further in discussion within the group and a number of topics for future research identified. At the following plenary session, each group chairman reported back to the full workshop on the discussion within their group. On the second day, a further three parallel sessions addressed affordable parallel processing, tools and CPU-intensive applications and then reported back in another plenary session. During the afternoon of the second day, the group visited the attractive new building of FORTH to see some of their current research projects in databases, parallel processing, image processing and communications. An interesting bonus was the opportunity (after thorough personal screening!) to see an El Greco painting on loan to FORTH for a short period for their official opening ceremony. In the evening, while the rest of the workshop participants enjoyed some sight-seeing in Heraklion, the Steering Committee met to review the topics for future work which had been identified in the parallel sessions. Members of the Committee were actioned to arrange brief presentations on each of these the following morning with the objective of identifying the possibilities for subsequent collaborative action within ERCIM. Everyone then adjourned to a splendid restaurant in the hills for a well-deserved traditional Greek dinner. Anyone interested in becoming involved in one of these areas should contact the driver in the first instance. Following the close of what was agreed by everyone to have been an extremely successful, useful and profitable workshop, the Steering Committee decided to hold a second workshop in Pisa, probably in the second quarter of 1995, to review progress within the Network with the various initiatives started at this workshop and to plan future ERCIM parallel processing activities in the light of progress with proposals to the EC Framework Programme. The thanks of everyone present are due to FORTH and in particular to Christos Nikolaou and Liana Kefalaki for their excellent organisation of the workshop. The venue, the weather and the company made the experience a memorable one for everyone. ERCIM researchers in parallel processing now know each other better and have sown the seeds of future collaboration.